Corded saws are part of every jobsite that involves framing, trim, or carpentry work. Our corded saw reviews include miter saws, circular saws, jig saws, and table saws. We also review other types of cutting saws like tile saws and metal cutting tools. A saw always needs to be powerful, so we look for corded saws that cut without losing speed or power. More than that, however, a good saw will have plenty of cut capacity, and features that set it apart. That might be a rear fence with tall base support on a miter, or a great fence on a table saw. 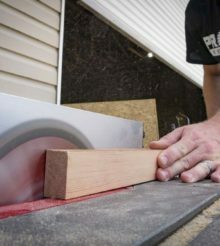 Our Best portable jobsite table saw shootout is a great example of the types of articles you can find here. A similar example is the Compact miter saw shootout. In terms of popular articles, try the Ridgid MS255SR 10-inch dual bevel miter saw review or check out 5 Essential Table Saw Safety Tips from the Pros.